We have 2 instances of Content Manager, and we want to alert users in case we are installing any release or doing some maintenance activities on the server. I just want to display a custom Message/Banner somewhere on the top which will be displayed during the maintenance activity. Can this be done without any restart or in a configurable way? Any help/leads would be appreciated. The easiest way is to put a file named app_offline.htm in your web site's root folder. Then your application will be taken offline and the clients will be served with app_offline.htm page whatever their requests are. When you are done with maintenance, just remove or rename the file and everything goes back to normal. I don't believe there's anything out of the box/supported for your purpose. Not sure why you want a banner as opposed to a proper page redirect, but taking your request for a banner (and I'll answer this as it may be required for warning of upcoming maintenance etc. ): Perhaps - only during maintenance periods you could intercept the requests at the server and manipulate the HTML to inject your message/banner. If there are any issues with the CMS support would, understandably, want to see such redirect/injection removed. Similarly, there are SSIs that could be updated but I'd steer away from physically updating any non-config CMS file without explicit confirmation from SDL Support (even just updating the timestamp may arouse suspicion/confusion and/or wasted time in validation etc.). Perhaps you could update the initial custom page - or loading icon to have the message; this wouldn't be permanent or in your face but is should be visible when users start up their instance. I guess the risks are that users haven't closed/restarted their browsers or they simply click 'open' and walk away. Maybe you can update the CSS and apply a specific 'maintenance' background image to the main content pane? Out of the box, you could use Tridion's message center to display the desired message to the content editors. There are a couple of existing examples on how to hook into it. I don't recall where exactly, but I do remember seeing them. Recently I implemented the "User Dashboard Custom page" for display a User Activities / User Outage Notifications will be displayed when user login into the SDL Tridion. 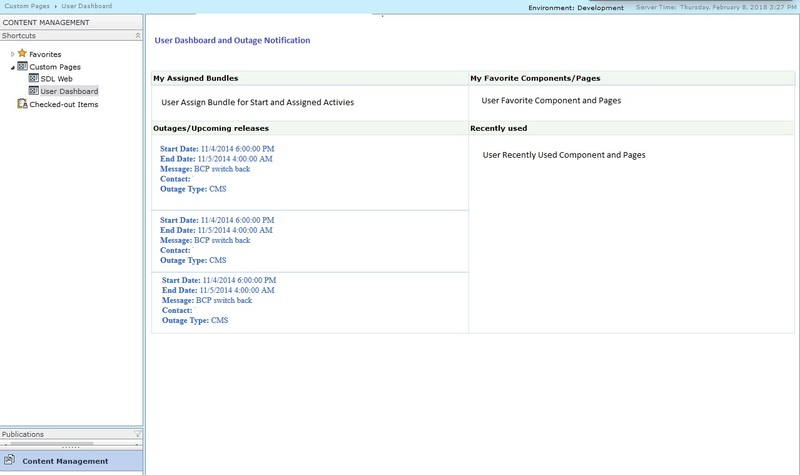 User Outage Notifications content read from admin component and displaying in Outage notification sections. This is best solution and user know the CMS maintenance activity when they login. If the server is undergoing maintenance of some sort -- you haven't specified what -- then what functionality would you expect to be available to the user? Would you expect it to be slower but still functional (for running server resource intensive tasks)? Would you expect sets of functionality to be missing (publishing, for instance)? Without this, it makes it hard to suggest a resolution other than a complete redirect to a "The server is undergoing maintenance for / until X time." page. Tridion 2013 MessageCenter, how to display message? Can we set “Content Explorer” page as default landing page in Tridion?